Mahjong Towers. 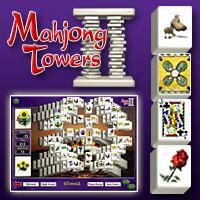 Download Mahjong Towers. Mahjong download. Step-up to Mahjong Towers with over 430 animated tiles. Enjoy 500 awesome and unique layouts with up to nine levels tall. Also download up to 100 new layouts every day. Use the board editor to create custom tile layouts that can be shared with players around the world. We have no player reviews for Mahjong Towers yet.